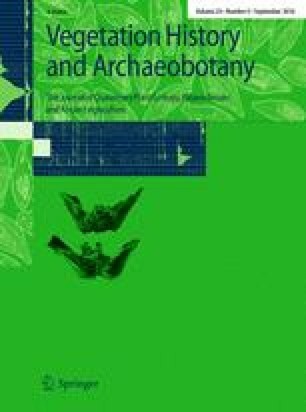 The isotopic composition of the remains of cereals and pine has been studied, from three different chronological phases from 2140 to 1500 cal bc at the Terlinques site, southeast Iberian Peninsula. The δ13C values range between −24.91 and −21.19 ‰ (V-PDB), with an average of −23.05 ‰ (STD = 0.69). The archaeological cereals show an average isotopic discrimination (Δ13C) with the past atmospheric CO2 of 16.96 ‰, which is much greater than the average Δ13C of 13.89 ‰ of the rainfed Triticeae (wheat and barley) in modern times. However, considering the effect of the atmospheric CO2 concentration, which is included in the WUEi (intrinsic water-use efficiency), this difference is even greater, 77 for archaeological samples versus 144 for present-day rainfed cereals. This could represent some of the earliest evidence of the use of irrigation techniques in Europe. Modern cereals which have been irrigated show a general Δ13C average of 17.17 ‰, very similar to those of the middle Holocene. However, when the WUEi is calculated, the value of 108 indicates that present-day irrigated cereals are more stressed than the archaeological samples. For comparison, we have included pine trees, since these have an extensive root development which is capable of reaching the water table. In the past, both cereals and pine present similar WUEi values (77 vs. 72), however at present only irrigated cereals show similar WUEi values to pine (108 vs. 107). This again suggests irrigation of cereals in the past. The processes of climatic degradation towards drier conditions which started in the middle Holocene could be responsible for the use of land near water sources, on riverbanks and near shallow lakes. According to the isotopic and plant macrofossil data, irrigation or water management techniques were used at the Terlinques site, located close to the Laguna de Villena, a lake which has now dried out. Communicated by C. C. Bakels. This work was supported by a FPU grant at the Spanish Ministerio de Educación, Cultura y Deporte AP2012-1353. This research has been carried out within the framework of “Proyecto Terlinques” funded by Conselleria de Cultura, Educación y Deportes of Generalitat Valenciana and the Project RNM-8011, the research groups RNM309 and HUM274 (Junta de Andalucía). We appreciate the willing disposition of Jesús Guardiola for the help in carrying out sampling in the town of Villena and Sergio Martínez for drawing the map. We wish to thank Corrie C. Bakels, James Greig and two anonymous reviewers for their comments.